"When I arrived at 4:00 p.m., the line for admission was at least a half mile long. People had been lining up since before 10:00 a.m., with the line snaking through a glass skyway where the afternoon sun had raised the temperature to over 100. I’ve seen shorter lines for Springsteen tickets, yet everyone was exceptionally polite. I only saw one protester on the walk over. He was standing on the street corner with his two small children and yelling “F*** Trump” as everyone walked past. On the way back to the car after the event I only saw three scraggly protesters trying to incite the crowd, to no avail other than getting detained by the police officers. I never saw the protest march or talk with anyone who saw it. At least 25 percent of the audience was under the age of 30, and around 40 percent were women. The senior citizen percentage was less than 10 percent — the lowest I’ve ever seen at a Republican event. Other than the hundred or so party leaders, this was a vastly different crowd from the Minnesota Republican Convention that I attended in Duluth three weeks ago. None of the attendees I spoke with in the concession line at the rally were politically active (other than voting) and none were born-and-bred Republicans. My big takeaway is that the atmosphere made Trump’s words almost irrelevant — and I mean that as a compliment. Trump understands emotion unlike any other politician I’ve followed. He stages his delivery with plenty of smiles, frequent claps (to the audience) and the longest walk to and from the podium I’ve ever seen. The two big differences between Trump and the usual politician are that (1) Trump never asks the audience for anything other than to be happy, and (2) Trump’s shtick is received as 100 percent authentic. 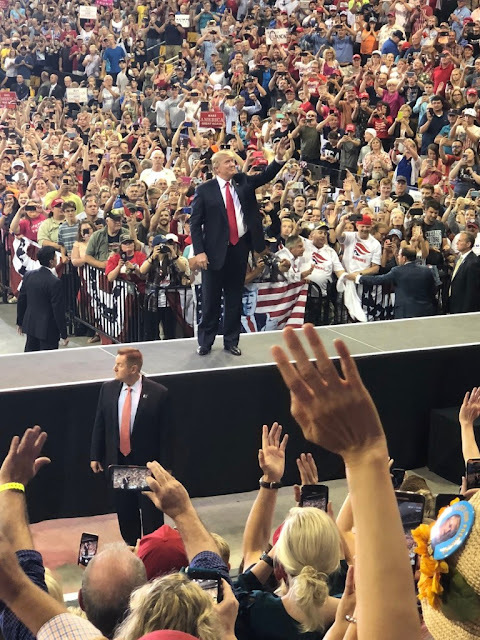 Until I saw it last night, I never would have believed that a one-hour political speech could capture a 10,000-strong crowd from start to finish. A Trump rally is the one political event where you have to be in the room where it happens to understand how it works.